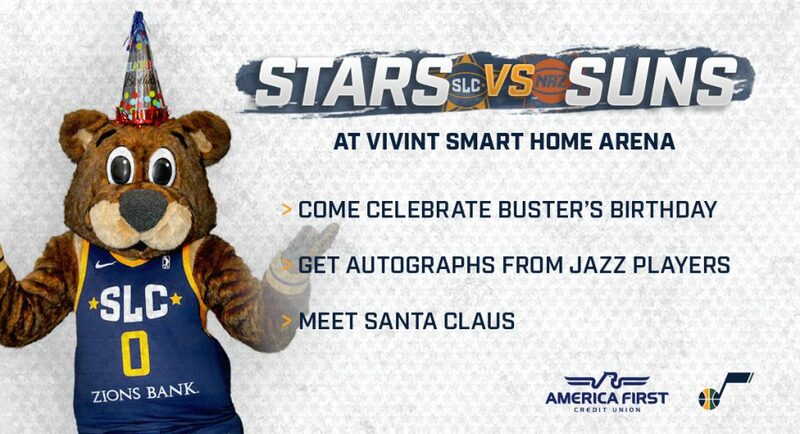 The Salt Lake City Stars, the NBA G League affiliate of the Utah Jazz will play at Vivint Smart Home Arena on Thursday, December 13 presented by America First Credit Union, when the team faces the Northern Arizona Suns. Doors open at 6:00 p.m. with tipoff at 7:00 p.m. Come celebrate Buster’s Birthday with his mascot friends. You’ll have an opportunity to meet Utah Jazz players and Santa Claus! The Kids Zone presented by University of Utah Health will be filled with bounce houses, face painters and balloon artists. At the conclusion of the game, the Stars team will participate in a postgame autograph session and we’ll invite kids to shoot free throws on the court.